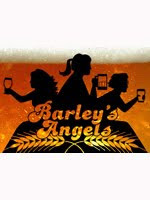 The Toronto Chapter of women’s beer appreciation group Barley’s Angels has announced its monthly event series for the 2011-12 season. These ladies-only events will be held at a variety of beer-centric establishments around the city. October 23rd, 2011 – Bottle vs Draught with McAuslan Brewery – No One Writes to the Colonel, 460 College St.
December 11th, 2011 – Brewing 101 with Lake of Bays Brewery – The Rhino, 1249 Queen St. W.
January 29th, 2012 – IPA Night with Spearhead Brewing – The Rebel House, 1068 Yonge St.
February 26th, 2012 – European Lagers with King Brewery – The Mugshot Tavern, 1729 Bloor St. W.
March 25th, 2012 – TBA with McClelland Premium Imports – The Town Crier, 115 John St.
April 22nd, 2012 – Barrel-Aged Beer with Beau’s All Natural Brewing – Smokeless Joe, 488 College St.
More details, including times, ticket ordering and membership information please visit the Barley’s Angels website.